Crossword puzzle fanatics are very protective of what they consider to be theirs. They get to know the patterns of their puzzle makers, are familiar with a designer's recurring clues, and even how the puzzle maker thinks. Crosswords may even provide a rythmn in solvers' lives whether it's in the escalating difficulty of the New York Times' puzzles, the Sunday monster puzzle, or clues themed to major holidays like the opening day of baseball season. Changes in these patterns are quickly noticed. So when the Wall Street Journal recently opened its pages to a flurry of crossword and other puzzles, for solvers it was like a three letter word for happiness. "Anecdotally, the reaction has been joy," said the Journal's Senior Deputy Managing Editor Mike Miller. Gotta say I am loving the new #crossword puzzle in the @WSJ. For the first time ever, I've opened the business section every day! The WSJ has been slowly edging into the world of puzzles, first creating a large Friday puzzle about 10 years ago. A couple years ago it added one to the Greater New York section and one in the Saturday Review section. "I've been here 30 years and I always thought that the only thing wrong with it was that it had no daily puzzle," Miller said. Miller, who calls himself a "puzzlehead," said the paper took a page from the Times of London ,which he said has a "gi-normous assortment" of puzzles to bolster reader habits and loyalties. There isn't enough data yet to determine whether the paper's more playful addition has made a difference in readership, either online or in newspaper sales. But he was encouraged that at the end of the first week more than 1,400 people submitted answers to the Friday puzzle contest. "That was way beyond my own expectations," he said, noting that it was a new feature and one that required several steps for the reader to complete. 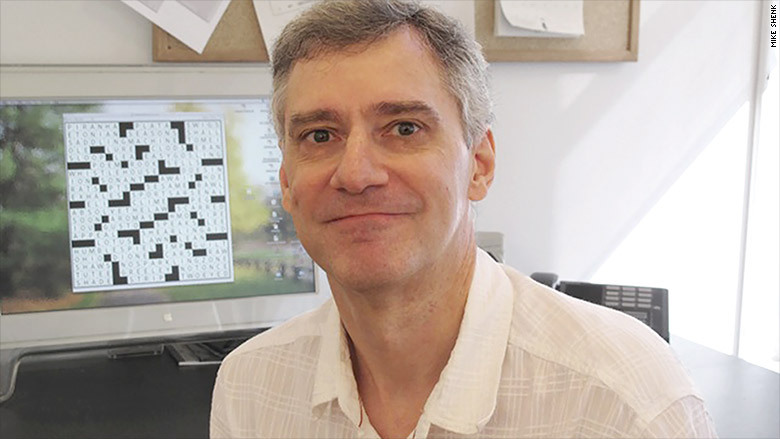 The job for the paper's puzzle master Mike Shenk has just expanded exponentially, but he said he still finds time to solve five or six crosswords a week "just for fun." But most of his time now is filled with creating puzzles or editing ones from contributors. Despite the fact that he doesn't design most of the puzzles, his editing touch is evident to regular WSJ readers. Shenk's work was applauded by New York Times' crossword puzzle legend Will Shortz. "I got a nice little email from Will Shortz at the end of the first week offering congratulations. And he had some nice things to say about the first week of puzzles," Shenk said. But puzzle solvers can be a prickly group, and are notorious for complaining to newspapers when they can't find it in the paper or online, or believe a clue was wrong -- even in the face such newfound plenty.